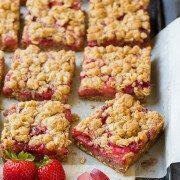 This easy Strawberry Rhubarb Crisp features a crunchy oatmeal crisp topping and is the perfect combination of sweet and tart. Top it with a scoop of vanilla ice cream or enjoy it warm as is! I never had really tried anything with rhubarb until the last few years. Once I did try it though, I instantly fell in love! I love the vibrant and unique flavor it has with just the right amount of tartness to it. My favorite way to eat rhubarb is baked into something along with fresh strawberries. 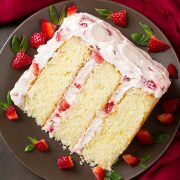 There are so many things I want to try with that combination, like a strawberry rhubarb compote for angel food cake, a strawberry rhubarb crumb cake or combining the two together for a syrup to serve over buttermilk pancakes. Someday I’ll get there, but for now it’s all about this truly delicious strawberry rhubarb crisp. This strawberry rhubarb crisp is perfectly juicy with just the right amount of sweetness, and the contrast in textures is spot on. I love the softness and juiciness of the fruit filling paired next to the perfect crispness of the topping. And also that lemon-like tartness next to the sweet flavor of vanilla bean in the filling. This fruit crisp is a must try summer dessert recipe! Just don’t forget the ice cream, because it’s the perfect finishing touch for this. Preheat oven and butter baking dish. Set aside. In a mixing bowl, whisk together all the oatmeal crisp topping ingredients, except for the butter and vanilla bean seeds. Then rub the butter and vanilla bean seeds in with your fingers until the mixture comes together in crumbles. In a separate bowl, toss together sliced strawberries, rhubarb and sugar and then transfer to baking dish. Whisk together orange zest, orange juice and cornstarch. Pour over the fruit mixture and toss to combine. Sprinkle oatmeal crisp topping onto the strawberry rhubarb filling. Bake for 40 – 45 minutes, until top is golden and the filling is bubbling around the edges. Can I Use Quick Oats in the Crisp Topping? No, the oatmeal crisp topping can only be made with old-fashioned rolled oats. Quick oats wouldn’t give you the same crispy, chewy texture. No, this rhubarb strawberry crisp is best with fresh berries. Frozen and thawed strawberries would result in a mushier texture, and the fruit crisp likely wouldn’t taste as fresh. Let the strawberry rhubarb crisp cool to room temperature on your counter before topping it with plastic wrap and refrigerating. Reheat the strawberry rhubarb crisp in the oven so the oatmeal topping stays crunchy. Don’t slice the fruit too small, otherwise it’ll turn to mush in the oven. 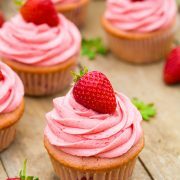 In a pinch, all-purpose flour can be substituted for cornstarch in the fruit filling (the filling might not thicken as much, but it’ll still taste good). Serve this fruit crisp warm with a scoop of ice cream for the ultimate springtime treat! One of my go-to summer desserts! You get a fresh, juicy strawberry and tart rhubarb filling topped with a crisp buttery oat crumble. Finish it with a scoop of sweet vanilla ice cream for an indulgent treat no one can resist! Preheat oven to 400 degrees F. Butter a 3 quart baking dish (I used a 12 by 8 by 2 1/2, a 13 by 9 should work fine too), set aside. In a mixing bowl, whisk together flour, oats, brown sugar and salt, while breaking up any clumps of brown sugar with finger tips as needed. Add butter and vanilla bean seeds and rub into mixture with finger tips until it comes together in crumbles and no clumps of butter remain. Transfer to refrigerator while preparing filling. In a mixing bowl toss together strawberries, rhubarb and sugar. Pour into prepared baking dish. In liquid measuring cup whisk together orange juice, orange zest and cornstarch until well blended. Slowly and evenly pour over strawberry rhubarb mixture in pan then lightly toss mixture. Sprinkle crumble evenly over top. Bake in preheated oven 40 - 45 minutes until juices are bubbling and crisp is golden brown. Serve warm with vanilla ice cream. Don't slice the fruit too small, otherwise it'll turn to mush in the oven. In a pinch, all-purpose flour can be substituted for cornstarch in the fruit filling (the filling might not thicken as much, but it'll still taste good).